The UC San Diego men’s basketball team defeated California State University, Stanislaus (82–81), California State University, Chico (66–49), and California State Polytechnic University Pomona (68–66) to take the California Collegiate Athletic Association title for the second straight year. The Tritons finish the season with an overall record of 21–10, and a 15–7 record in CCAA conference play. The Tritons defeated the Warriors with a miracle 3-pointer by junior guard Christian Bayne in double overtime. Both teams were evenly matched, with both teams unable to hold onto their leads throughout regulation. Near the end of the game, UCSD found itself down 2 points with 17 seconds remaining. Bayne was fouled and sank both of his shots from the line, tying the game up at 64–64. The Tritons locked in defensively and prevented the Warriors from scoring. Both teams stayed locked in for the first overtime — neither the Tritons nor the Warriors could find good shots, and the period came down to free throws again. When the Warriors were up 71–73 with five seconds left in overtime, Bayne was fouled and sent to the line. As has become custom, Bayne knocked down both free throws and tied the game at 73–73. On the other end, senior forward Kenny Fraser blocked a Warrior 3-point attempt to send the game to double overtime. The second overtime was a thriller. The teams traded baskets back and forth until the final minute when UCSD faced a potential exit from the tournament. The Tritons were down 79–81 and the clock was ticking. As the final seconds ticked away, sophomore forward Scott Everman missed a 3-pointer that was then rebounded by Bayne, who then launched a 3-pointer with three seconds remaining in the game. He sank the 3-pointer, giving the Tritons an 82–81 victory. Junior swingman Christian Oshita finished with a career-high 29 points and also notched 11 rebounds and 4 assists. Bayne had 25 points and 8 rebounds. UCSD blew out Chico State in the semifinals of the tournament. The first half started slow, and it looked like a competitive game. However, the Tritons turned up the heat in the second half and coasted to a 66–49 victory. The Tritons held the lead for almost the entire game while the Wildcats had their biggest lead (one point) for about 37 seconds in the first half. For the rest of the game, UCSD was in control. Their lead was challenged a couple of times in the second half when the Wildcats had scoring runs and cut the deficit to 3. In spite of this, the Tritons stayed calm under pressure and forced key turnovers. These turnovers led to a high number of 3-pointers for the Tritons, which helped them quickly rebuild the lead. In the final three minutes of regulation, UCSD grew an 11-point lead to 17 and defeated Chico State, 66–49. Oshita finished the game with 20 points and 9 rebounds. Redshirt freshman guard Mikey Howell chipped in with 11 points and 3 assists. As a team, the Tritons were a perfect 15–15 from the free throw line. At Pomona, the Tritons faced the Broncos in the final game of the CCAA Men’s Basketball Tournament. The Broncos charged out of the gates in the opening minutes and quickly gained a 7–2 lead. UCSD responded with 3-pointers from Bayne and senior guard Anthony Ballestero. Howell and senior forward Michael Shoemaker snatched 1 steal apiece and the Tritons converted both opportunities off the turnover. With the game tied at 17–17 after a Broncos dunk, Fraser made a layup to put the Tritons up 2. From there, the Tritons only allowed 4 more Bronco points in the first half while scoring 8 of their own, going into halftime with a 28–21 lead. UCSD demolished Cal Poly Pomona for 15 out of the 20 minutes of the second half. The Tritons made play after play, scoring from all over the floor. They quickly gained a 19-point lead within the first five minutes of the half. Over time, the Broncos slowly chipped away at the lead. The game picked up in the final minutes of regulation. Up 11 points, the Tritons looked to maintain their lead. However, with two minutes left to go, 2 consecutive turnovers led to Bronco baskets, and UCSD’s lead was cut to 6. The game slowed down and both teams turned up the defensive pressure. The Broncos intentionally fouled players while pushing the ball hard on the offensive end. Missed free throws almost cost the Tritons the game, as the Broncos were converting most of their shot attempts. With the three seconds left in regulation, Cal Poly Pomona hit a 3-pointer to bring the game to 67–66. 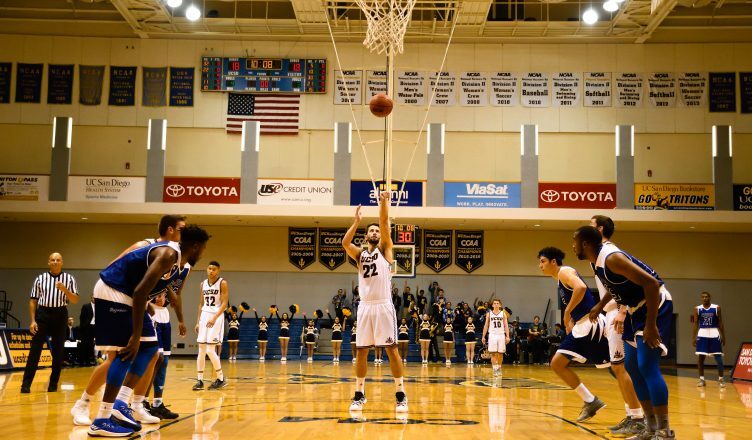 Oshita was sent to the line, where he split a pair of free throws to give UCSD a 68–66 lead. The final buzzer sounded, and UCSD claimed its second consecutive CCAA championship title. Three Tritons scored in double figures for UCSD: Bayne (16), Oshita (10), and Ballestero (12). As a team, UCSD made 4 more 3-pointers than Cal Poly Pomona and shot 47.8 percent (22–46) from the field. UCSD will now advance to the NCAA Division II tournament, where they have played four times. In the last two years, the Tritons have reached the Sweet 16 both times. Matchups were announced on the NCAA website at 7:30 p.m. on March 4.